You are Achilles, the greatest hero Greece has ever known. You fight with honor and pride. Your skills at arms are unmatched. You have never experienced defeat. But on the battlefields of Troy you have a decision to make: stay true to your code of honor and not fight, or come to the aid of your countrymen and win fame and glory, becoming an even greater legend. 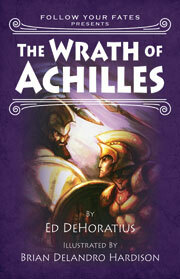 In The Wrath of Achilles, you become Achilles, hero of all of Greece. You confront the same choices he faced in the pages of Homer's Iliad, but with a twist: you are in control of your destiny. You can choose a different path as you follow you fate. Thirteen different endings await you. Only one path leads to glory. Twelve lead to death, defeat, and shame. Young people ages 8 and up will learn the Iliad from the inside out with dramatic text by Ed DeHoratius, dynamically illustrated by award-winning comic book artist Brian Delandro Hardison.